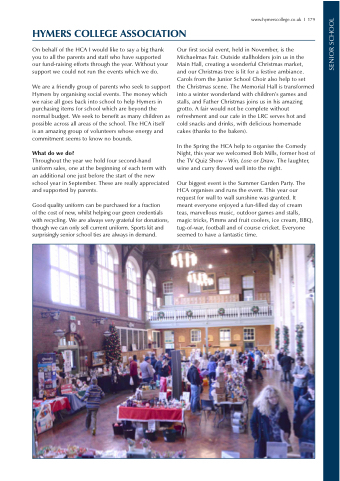 On behalf of the HCA I would like to say a big thank you to all the parents and staff who have supported our fund-raising efforts through the year. Without your support we could not run the events which we do. is an amazing group of volunteers whose energy and commitment seems to know no bounds. Throughout the year we hold four second-hand uniform sales, one at the beginning of each term with an additional one just before the start of the new school year in September. These are really appreciated and supported by parents. of the cost of new, whilst helping our green credentials with recycling. We are always very grateful for donations, though we can only sell current uniform. Sports kit and surprisingly senior school ties are always in demand. and our Christmas tree is lit for a festive ambiance. Carols from the Junior School Choir also help to set the Christmas scene. The Memorial Hall is transformed into a winter wonderland with children’s games and stalls, and Father Christmas joins us in his amazing grotto. A fair would not be complete without refreshment and our cafe in the LRC serves hot and cold snacks and drinks, with delicious homemade cakes (thanks to the bakers). In the Spring the HCA help to organise the Comedy Night, this year we welcomed Bob Mills, former host of the TV Quiz Show - Win, Lose or Draw. The laughter, wine and curry flowed well into the night. meant everyone enjoyed a fun-filled day of cream teas, marvellous music, outdoor games and stalls, magic tricks, Pimms and fruit coolers, ice cream, BBQ, tug-of-war, football and of course cricket. Everyone seemed to have a fantastic time.